HD Radio, also known as IBOC (In Band-On Channel), is the United States’ choice for digital radio broadcasting. It debuted locally in my area in 2006. One of the (few) benefits of HD Radio for listeners is the ability for capable stations to display their callsign on the screen of any HD Radio. For DXers, this is a major plus, because during an intense tropo or Sporadic E event, one could theoretically identify any received IBOC signal immediately without the need to listen to the station for several minutes for an audio ID, potentially during a time when the signal would fade out, never to be heard (or identified) again. 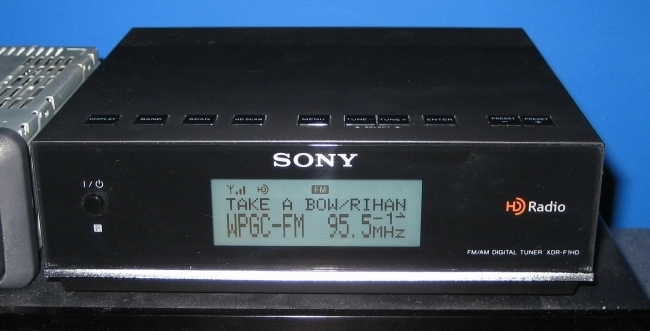 The Sony XDR-F1HD radio displaying an HD Radio decode from 95.5 WPGC Morningside, MD, in 2008. I purchased my first HD Radio, the Sony XDR-F1HD, in 2008. The first HD Radio signal I received via Sporadic E was in May of that year, 97.5 KMOD Tulsa, OK, at 1045 miles away. The distance didn’t matter–I knew it was KMOD the moment I tuned to 97.5 FM, since the station’s callsign flashed on my screen, as seen in the picture to the right. Occasionally, I would come across a station broadcasting an incorrect callsign in the early days of HD Radio, such as my local 93.9 WKYS identifying as “KHRS-FM” for the better part of one day in 2008. Ironically, a friend of mine in the Houston, TX area found the same incorrect KHRS callsign on his local 97.5 FM, whose real callsign was KFNC, in 2011. Other stations occasionally displayed some variant of “HD-FM” or “HDHD-FM” at some point, too. Just like the appearance of the KHRS calls on multiple stations, the error was often quickly fixed to the correct callsign. Even still, it posed an issue for listeners wondering the true identity of what station they had tuned in. For a few years it was a given–if your radio decoded an IBOC signal, you could positively identify it with minimal effort. Although the aforementioned errors were rare, things started to change in the first half of the 2010s. During a Sporadic E opening in 2010, I received a callsign from an HD Radio signal that said “RRR.” Knowing that “RRR” was not a valid United States callsign, I had to listen to the signal to see what it was and where it was coming from. I quickly learned that “RRR” stood for “Red River Radio,” a public radio network in Texas and Louisiana. The station itself was 88.9 KLDN Lufkin, TX. A year later, I picked up a station identifying on my radio screen as “TROY-FM,” which was later found to be 88.7 WRWA Dothan, AL, a signal broadcasting from Troy University. By 2015, the sheer majority of HD Radio signals I encountered both via DX and while traveling in other cities largely still had their actual callsign displayed when tuned in. This slowly began to change. I noticed more and more stations showing their station name instead of their callsigns when tuned to HD Radio, most notably stations named “Kiss FM.” Instead of callsigns, the HD Radio displayed “KISS-FM” on many of these stations. In the following years, many radio groups switched their entire portfolio of HD signals in certain markets from callsign displays to name displays. It isn’t happening in every city in America, but it is common enough that most major cities have at least two or three stations now with name displays. The phenomenon was most obvious in Pittsburgh, PA. I first visited Pittsburgh in 2016 and established an extensive DX log during my stay. At the time, 10 of the city’s HD Radio signals had callsign displays, while two (96.1 WKST & 104.7 WPGH) had name displays, “KISS-FM” and “BIG -FM,” respectively. When I returned to the market in 2019, four more of the same stations that previously had callsign displays switched to name displays, bringing the total of stations utilizing name displays in the market to six. My local market of Washington, DC is unique in that all 21 HD Radio signals currently broadcasting still display their callsigns in their HD displays as of 2019. None have name displays. Even so, there have been many changes in exactly what callsign appears on each signal. Over the years, most of the signals in Washington flip-flopped between displaying their callsign with the “-FM” prefix at the end, to simply displaying the four-letter callsign itself. This had no bearing on if the station’s actual callsign legally had “-FM” as a part of it or not. In 2018, three Washington signals had “-FM” at the end of their callsign display: 88.5 WAMU, 93.9 WKYS, and 102.3 WMMJ. Interestingly enough, I also noticed local 96.3 WHUR’s usual HD Radio display was replaced with an errornous “HD” callsign on April 4, as seen on the right screenshot below. I predict this will be fixed in the coming days. Personally, I prefer the actual station callsign to be always visible on HD Radio signals. Although it is always amusing to see how creative station owners can get with fitting a station name into a four-digit “spot” on stations that do have name displays, I think that it takes away from the intended purpose of HD Radio in terms of being able to identify which signal is being received. It also makes DXing much harder because there is the chance of a distant signal coming in and disappearing before it is identified–even if its IBOC signal is fully decoded. My prediction: within the next few years, at least one Washington HD Radio signal will switch to a name-based digital screen ID. We will see how right I am in the coming years. On an unsuspecting early morning in my teenage years, I tuned up and down on my radio, trying to find something to listen to. A song on a very clear radio station caught my ear, so I left my radio there and went back to what I was doing. The station identified as “Z104,” but something wasn’t right. The frequency was wrong: 104.5 FM. My local “Z104” with a similar format broadcasted on 104.1 FM. Was my radio broken? I received my first DX signal, 104.5 WNVZ, on this Philips-Magnavox boombox in 1999. I sat in my desk chair, eyeing the bright “104.5 MHz” on my radio’s screen as local commercials for the Virginia Beach area played one after another. Were my ears playing tricks on me? How could I be listening to something over 120 miles away, when it sounded just as clear as any typical local station? Intrigued, I tuned up and down the dial, finding more unfamiliar stations from Richmond, VA (75 miles away) and even more from the Norfolk area. I had an old portable TV in my closet, so on a hunch I pulled that out, and was even more surprised to find a chorus of strange TV stations coming in on all channels from central and southeastern Virginia. All of them aired the same things that I saw on my local TV stations, until the morning news came on. 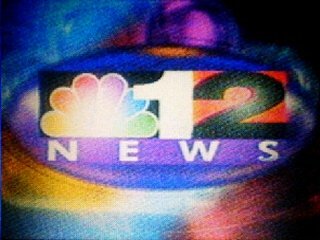 Richmond’s channel 12, WWBT, was received for the first time as seen above in 1999 shortly after I heard WNVZ. 20 years ago today, my unexpected exposure to the hobby of DXing started all with my reception of WNVZ near Washington, DC. I found each night that reception was different–some nights Norfolk FM & TV would blare in, while at other nights, Ocean City, MD or Philadelphia, PA came in instead. It became second nature to write down all I was receiving so I’d remember what city everything was from, in the process creating a thoroughly-detailed DX log, which I keep updated to this day. I wanted to look back at how DXing has changed since 1999. The basic principles of DXing have never changed (i.e. the need to identify unfamiliar signals), but the tools available now in 2019 to do so are much more advanced than what I had that morning when I first logged WNVZ. Although the internet was operational in 1999, the resources needed to adequately identify signals for DXing purposes weren’t always there. Some great websites like Radio Locator and (now defunct) DXFM.com were invaluable resources for station data in the late 90s. Even so, many radio stations at the time had little to no web presence online. Those that did often had outdated or incomplete information, such as no mention of the station’s slogan on their website. WNVZ received again at my home with HD Radio in 2017. The 2000s brought great change to the hobby. RDS became commonplace by mid-decade, allowing many stations to be IDed by on-screen text. 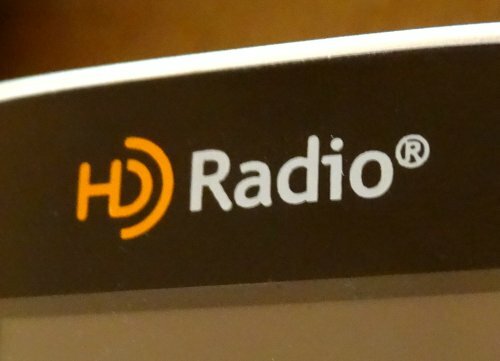 HD Radio debuted locally in 2006, shuttering most open and usable frequencies immediately next to local FM stations, replacing the once empty frequencies with digital “sidebands” that blocked out all but the most strongest DX. Sites like Yes.com provided lists of current songs playing, which was extremely helpful during Sporadic E openings, and DXers came in droves to online propagation loggers like the TV/FM Skip Log, which helped spread the word for signal propagation events. The technological innovations stagnated in the 2010s, with the only major change in FM DXing being an almost annual downturn in occurrence of Sporadic E openings, new stations turning on HD Radio broadcasts (and many more discontinuing the service), and the few open frequencies being taken up by new translators seemingly popping up every day. Even with all of these changes that were both a benefit and a detriment the hobby over the years, I still somehow managed to garner 1910 unique FM logs and 222 TV station logs. Hopefully we’ll be all around for me to announce my 40th FM DXing anniversary in 2039. Stay tuned! The dial is always changing. The actual format flip will apparently happen in summer 2019 when the transaction closes, not March 1 as previously thought. The “Mix” branding and WRQX calls will stay with Cumulus, meaning they could reuse the combination in another market, or they could resurrect WRQX as “Mix” on co-owned 105.9 WMAL in DC after the deal closes. This also guarantees that 107.3 will get a new callsign this summer, the first new callsign for the station in over 40 years. A radio deal between Educational Media Foundation (“EMF”) and Cumulus Media will result in six major United States cities getting a new Christian radio station. Among the stations announced February 14 include 107.3 WRQX Washington, DC, a local radio station of mine. The move also marks the second time within a year that a radio station in the Washington market has ditched the hot adult contemporary format, after cross-town 94.7 WIAD flipped to classic hits in October. WRQX, along with five other stations in New York, NY (95.5 WPLJ), Atlanta, GA (106.7 WYAY), San Francisco (97.7 KFFG), Savannah, GA (102.1 WZAT), and Syracuse, NY (105.9 WXTL), will become EMF stations this summer, according to press releases from both Cumulus and EMF, linked here from RadioInsight.com. Although seemingly not related to the EMF deal, Cumulus also said in their release that they will swap ownership of stations in Indiana, Massachusetts, and New York with Entercom. EMF runs three Christian Contemporary networks: AC-leaning “K-Love”, CHR “Air 1,” and “K-Love Classics,” which airs recurrent songs from previous decades. It is unclear exactly which network WRQX and the other signals will pick up. RadioInsight.com did a great job of reporting on how the shockwaves from this deal will reverberate throughout the radio industry. I decided to take a look at the deal’s immediate effect on the Washington, DC radio market, as well as how it will affect DXers in the Mid-Atlantic area in range of WRQX. For years, the main Christian Contemporary (“CCM”) radio outlet in the Washington, DC area has been 91.9 WGTS Takoma Park, MD. 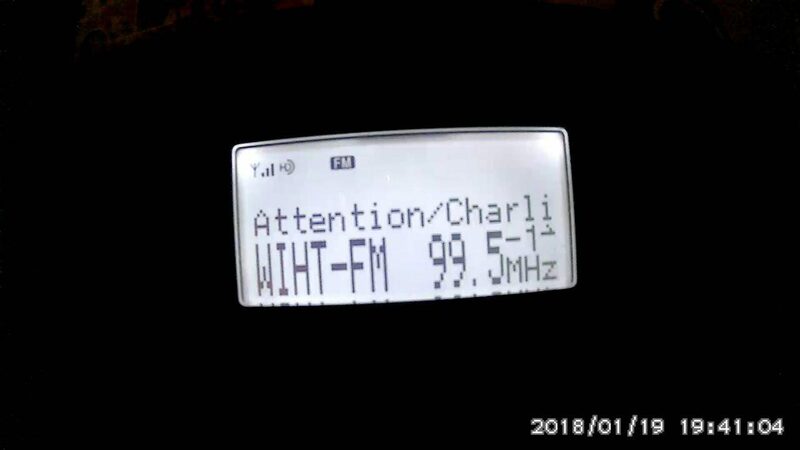 Listeners in Northern Virginia also had access to the “Your PER” network of simulcasted CCM signals (89.9 WPIR Culpeper, VA, 90.5 WPER Fredericksburg, VA, and a chorus of translators throughout Virginia), while those in the Maryland suburbs of DC can hear nearby Baltimore, MD’s “95.1 Shine FM” WRBS. DC’s 105.1 WAVA Arlington, VA, which airs spoken religious programming, occasionally airs CCM music. Even with suburban and distant signals offering the same format, WGTS was the go-to place for Christian music in Washington. I always see WGTS bumper stickers on cars and advertisements on buses, a nod to the station’s popularity. Introducing K-Love to this “one-horse town” will likely drive listeners away from WGTS, WRBS, and the “PER” network, especially if listeners are familiar with K-Love from being in other cities where it can be heard. Once WRQX flips, there will be no hot AC radio station in Washington. The closest the city will have to the format will be adult contemporary 97.1 WASH, which airs more 80s music and less upbeat songs compared to what Mix plays. It will be interesting to see if another station in Washington picks up the hot AC format to fill the void. The closest stations with an hot AC format are 101.9 WLIF in Baltimore, MD (42 miles from DC), Fredericksburg, VA’s 101.5 WBQB at 45 miles, and Winchester, VA’s 92.5 WINC, at 54 miles away from the city. Neither WLIF, WBQB, or WINC make it into office buildings and businesses in downtown Washington, where many doctors offices and businesses play the format in waiting rooms. I predict WASH will win this battle, unless offices migrate to more upbeat signals, like CHR 99.5 WIHT. WRQX has had a long span of consistent formats over the years. From 1979-1990, the station was CHR “Q107.” It was hot AC “Mix 107.3” from 1990-2013, and again 2015-today. The signal was CHR with a slew of names (“All The Hits 107-3” and “DC’s 107-3,” to name a few) between 2013-2015. Ironically, after the flip, WRQX will be in competition once again with WAVA, something that hasn’t happened in the market since WAVA was also CHR in the 1980s. EMF purchasing WRQX makes sense. Save for a translator here and there, K-Love was largely absent from the Washington, DC region until 2017, when EMF bought nearby 94.3 WWXX and flipped it to K-Love. The station, now WLZV, broadcasts 2 KW in a rural area 45 miles southwest of Washington and cannot be heard in the city due to a local LPFM on 94.3. If EMF wanted to penetrate the DC market, they needed to do it on another signal, and WRQX was a logical choice, given how its 19.5 KW signal reaches the entire DC area, including the mountainous areas to the west, with ease. I’ve seen WRQX’s ratings slip over the years, so if a sale was to happen, it likely would’ve been a station like WRQX, instead of high-rated 103.5 WTOP or 96.3 WHUR. From a DXing perspective, WRQX’s flip is actually good news. I often get K-Love signals via tropo or Sporadic E propagation, and it is good to have a local signal to quickly compare songs heard on distant signals to during DX events. It saves me from having to tune in the K-Love audio stream each time a suspected K-Love signal is heard. The downside is that since K-Love is a nationally-broadcasted network of stations, the only local content heard is the top-of-the-hour legal ID. This is in stark contrast to the current WRQX, which has local DJs and other local content after every song. And, of course, the fact that employees both on-air and behind-the-scenes at WRQX will likely all lose their jobs after EMF takes control is unsettling. It is unclear if WRQX will get new call letters with the format flip, but several online sources have hinted that the calls will change next month. My prediction is that WRQX will air K-Love, and the call letters will be something like WLVD or WLVW (the latter being currently on a K-Love station in Maryland, but the calls can always be moved). We’ll see how right I am in the coming weeks. After realizing that my dial scan video on my Local FM Stations page was almost nine years old, I decided it was time to update the video, using my recently-acquired Sangean HDR-14. This video shows an accurate representation of signals received at my home without tropospheric enhancement. The new video above from 2019 has been added to my Local FM Stations page. 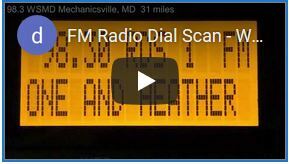 You can still find the old 2010 dial scan video and other radio and TV DXing-related videos on my YouTube channel. 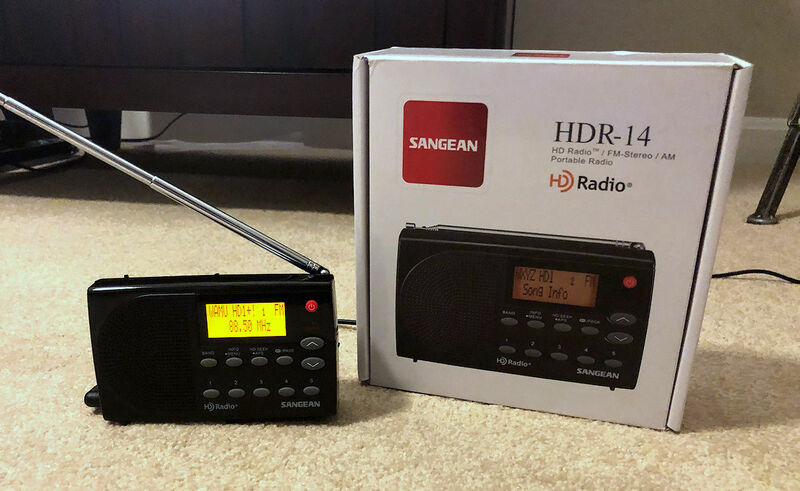 The Sangean HDR-14 portable HD Radio with box. Having been an HD Radio-capable DXer for over a decade now, I’ve seen many radios come and go, including the legendary Sony XDR-F1HD, as well as others, like the ultra-portable Insignia NS-HD01 and its cousin, the tabletop Insignia NS-HDRAD2. 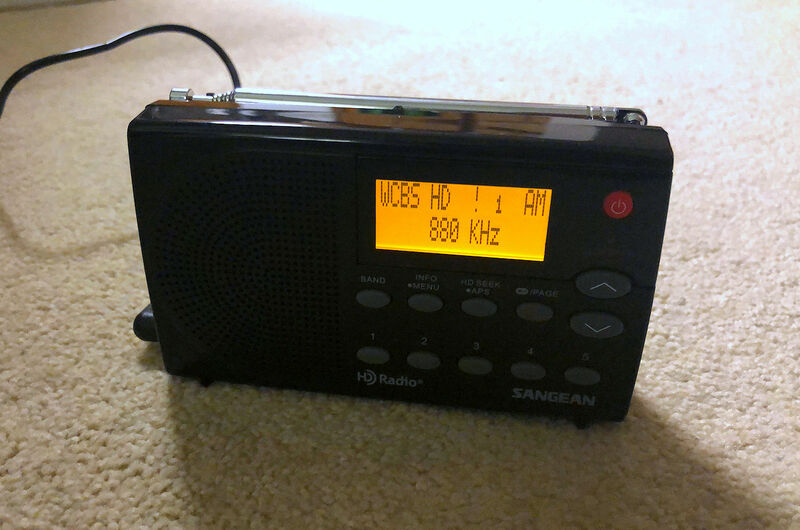 I’ve heard about Sangean’s lineup of radios, but none seemed that interesting to me until I came across the Sangean HDR-14. The HDR-14, a new release for 2018, is a portable radio that can handle both FM and AM HD Radio with ease. The HDR-14, which is $77.58 at time of publication on Amazon, is tiny, at 5″ x 3.02″ x 1.28″, smaller overall than a typical iPhone but a little thicker. It fits easily in the palm of one’s hand and is powered with the included AC adapter or three AA batteries. 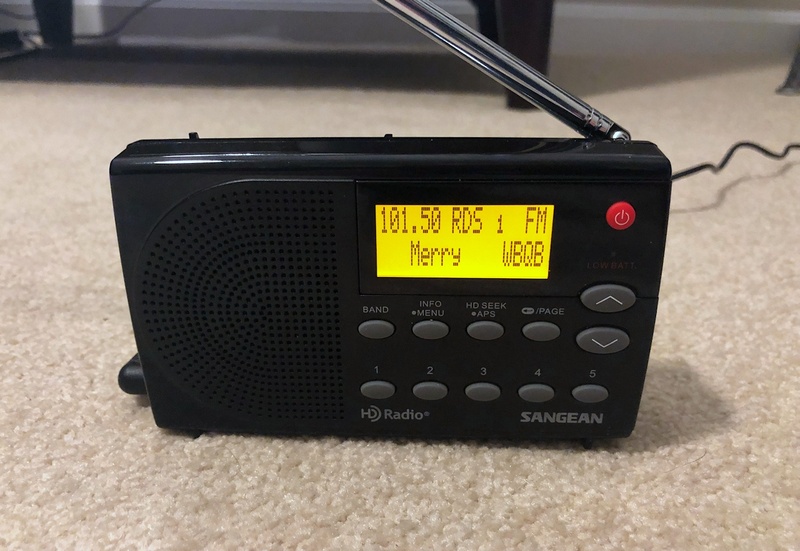 The Sangean radio was quick to tune in all of the typical analog FM signals within 70 miles that usually come in during deadband December conditions. Reception seemed on par with other portable radios I own, including both Insignias. I’m sure when DX conditions are present that this radio will excel in getting stations further away. RDS was decoded on almost all of my regional signals that utilize it. Most surprisingly, the HDR-14 decoded RDS from two very weak Washington, DC FM translators, something that even the Airspy has difficulty doing at my home. Although the radio only affords one line for RDS, you can cycle through the screen to see the PT, PTY, and other RDS fields. The Sangean HDR-14 decoding RDS from 101.5 WBQB Fredericksburg, VA at 24 miles away on 12/22/18. Perhaps the best feature with RDS on this radio is the ability for it to show radio station callsigns derived from its RDS PI code. 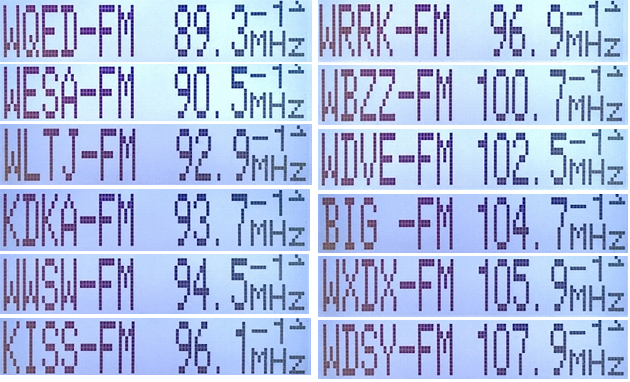 In the screenshot above, the “WBQB” calls were derived from the station’s broadcasted PI code, 58ED. For reasons unknown to me, I’ve noticed this feature doesn’t work on all stations broadcasting RDS, and unlike the Airspy, this is not the first RDS data point decoded. As with any radio that displays PI codes or callsigns derived from PIs, if the radio station itself broadcasts the wrong PI code (i.e. most iHeart stations), the wrong callsign will appear on-screen. This is a problem rooted with the broadcaster and not the radio itself, but it is important to point out. 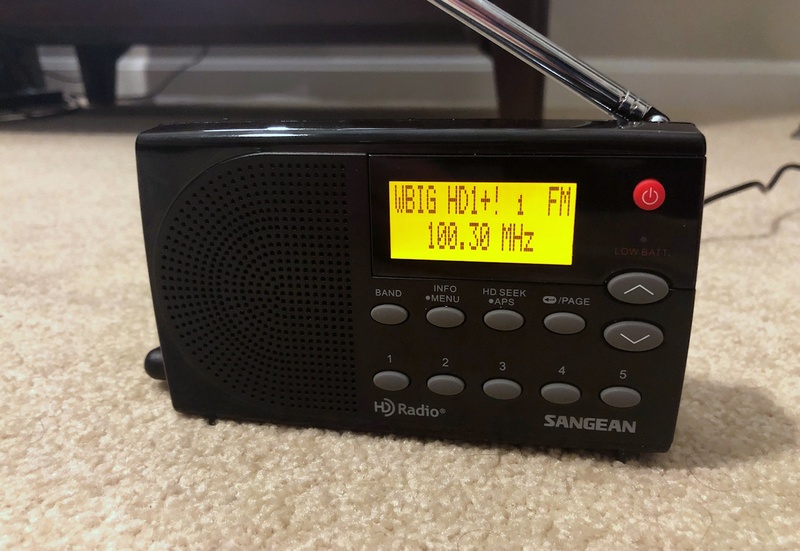 The Sangean HDR-14 radio decoding HD Radio from 100.3 WBIG Washington, DC at 24 miles away on 12/22/18. This radio is very sensitive detecting HD signals. My local FMs, at 15-20 miles, decode fully in HD even with the antenna all the way down, which is not possible with the Sony or Insignia radios. The radio displays HD callsigns in the top left corner at all times but it does not show the “-FM” extension that some stations broadcast. The frequency disappears on-screen when HD is decoded, but you can toggle it back on through the menu, like I did in the picture above. You can also view HD radiotext on the second line of the screen if you cycle through the menu. The radio allows you to tune to HD2 and HD3 signals, where available. The Sangean HDR-14 decoding 880 WCBS New York, NY at 238 miles away on 12/23/18. Although I’m sure there are better AM radios out there, I was blown away with how good the AM section is on the HDR-14. It sounds just as good as the XDR-F1HD’s AM radio. It picked up the usual regional AM powerhouses from Boston, Chicago, and New York at night, and at the same time I heard some of the more rarer signals that even the XDR-F1HD can’t get, such as a tiny 10-watt AM station at a community college 5 miles away from me. Simply put, the HDR-14 is a respectable AM radio and it is probably going to be my primary AM radio now, given how easy it is to move room to room with it in my home. AM HD Radio on the Sangean radio was comparable to the Sony XDR-F1HD, with the same stations decoding their HD signals. Much like on FM, you can toggle between HD radiotext and the frequency on the screen’s second line when an HD Radio signal is decoded. Although I haven’t had a chance to take this radio outside of the United States, it appears to be the best-suited radio out of the many that I have in my shack to handle international radio conditions. Beyond being small enough to throw in a bag, it can be programmed to tune in 50, 100, and 200 KHz steps for FM as well as different tuning steps for AM in foreign countries. The radio also can be reprogrammed to tune down to 76.1 FM, the beginning of the FM dial in Japan. These features are very rare to find in radios sold in the USA. I know that regardless of wherever I go, this radio will work. Of course, HD Radio will only be available in the USA and some areas in Mexico and Canada, but RDS should work just fine abroad. The HDR-14 has this handy little kickstand on the back that swivels out to keep it upright on a table. Even though I love this little radio, it is not perfect. The HDR-14 is not a clone of the Sony or Airspy radios and it should not be considered to be a primary DXing radio. The radio’s selectivity leaves a little to be desired, as I noticed some bleedthrough on frequencies adjacent to local FM stations as if the radio’s IF filters were set a little too wide. With that said, however, the radio is very sensitive and it will tune in a very weak signal on an adjacent-to-local frequency right over the minor bleedthrough, so I don’t think this is a dealbreaker for me with this being a secondary radio. The backlight of the Sangean HDR-14 only stays on for a few seconds at a time. As seen in the above picture, the backlight of the HDR-14 only stays on for a few seconds after a button is pressed, which is a disappointment. The reflective screen sometimes makes it difficult to read without the backlight on. The radio itself is also fairly shiny, which shows fingerprints. For its price, the plastic on the radio could’ve been a little more robust and/or texturized. The radio also only has one speaker and isn’t the best of quality, but it is loud and suffices for its intended use. The included headphone jack is an improvement over the speaker’s sound but it does not have good stereo separation, even when an HD Radio station is tuned in. The Sangean HDR-14’s long and fragile extendable whip antenna. The radio has a generously long antenna, but the thinner “sections” close to the tip are fragile and seem prone to bending if one isn’t careful while using it. The radio will actively decode HD Radio whenever available and you can’t disable this, which is a downside if any given station’s HD broadcast sounds worse than its analog counterpart. This seems to be a limitation in most HD Radios on the market, so although I don’t fault Sangean for not including this feature with the HDR-14, it would’ve been nice if they did. If one buys this radio understanding that it won’t be a powerhouse DXing radio, then they will love it. 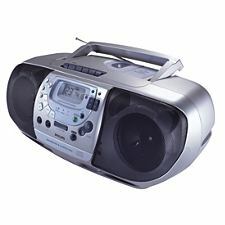 It’s a perfect travel radio to throw in a bag and take to the beach or the park. It can quickly pick up HD signals and it performs well in the AM band, too. Screenshots from the Sangean HDR-14 are clear and easily readable, such as this one from 101.1 WWDC Washington, DC. For DXers who like to screenshot RDS and HD Radio decodes, this radio provides a perfect screen with robust information, even if you have to scroll through to see it all. Even with its several downsides, this radio has replaced the Insignia NS-HDRAD2 as my secondary travel radio and I do recommend it to all. 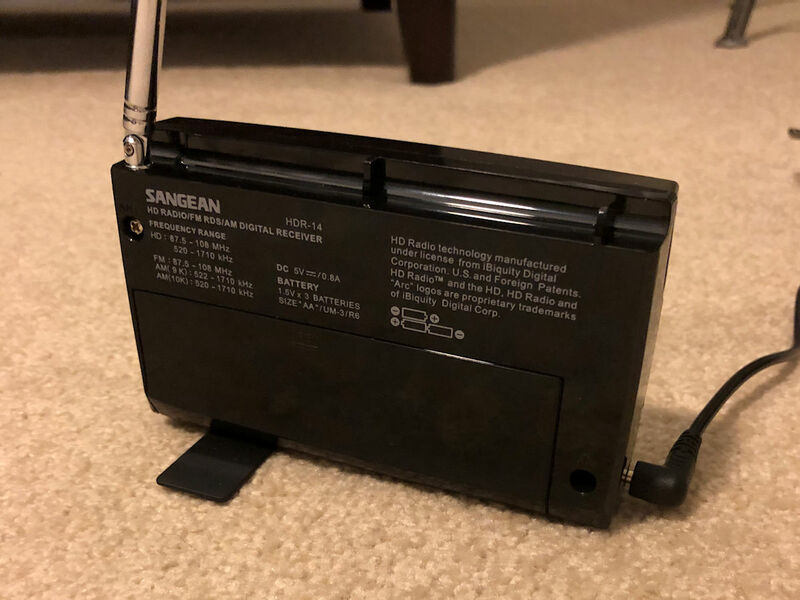 I will still travel with my Airspy R2 as a primary radio, however, due to its reputation as one of the best FM radios out there, but the Sangean HDR-14 has earned its place in my ever-growing collection of radios. 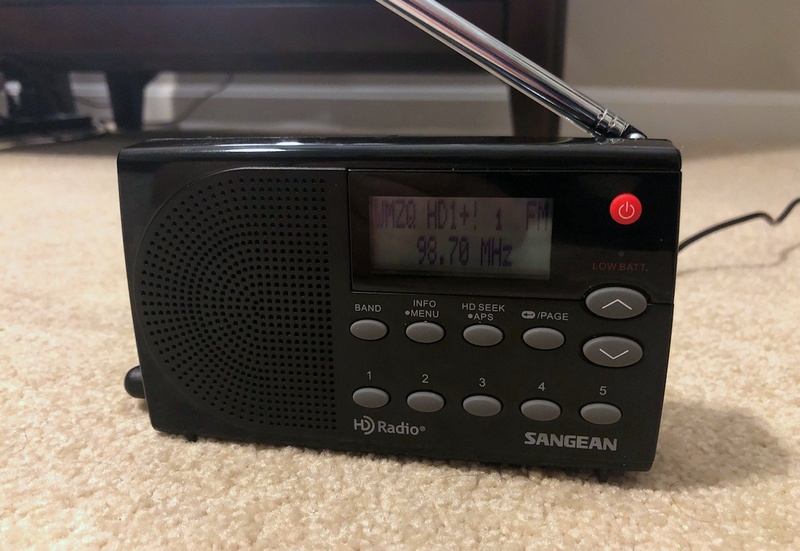 My RDS and HD Radio Screenshots pages have been updated with new RDS and HD Radio screenshots from the Sangean HDR-14. It started out with a bang but ended without fanfare. The 2018 Sporadic E-Skip Season is no more, but even though this season has failed to live up to what I thought it would be, I still feel like it was a step in the right direction. Sporadic E is a method of signal propagation that, when in effect, allows broadcast signals to be received up to 1500 miles away with clear local reception. It can happen any time of the year, but it is most common during the summer months. When I started to monitor daily for FM Es in 2006, living in the summer months usually meant having to plan everything around an always-present Sporadic E opening. I’ve turned down social invitations and put off errands countless times because a mammoth FM Es opening was brewing on the dial. Beginning in 2009, Sporadic E came in less and less, getting progressively got worse each year until it hit a lowpoint in 2017, where I only received 33 minutes total of Sporadic E the entire season — compared to 1471 minutes in 2014. On the surface, 2018 seemed to be the first skip season in years where things started to turn around. This year, I received 347 total minutes of skip with 5 new FM logs from 8 openings. During this season, I logged my 1900th FM station, and 4 of my 5 new FM logs were received from one unattended opening on 6/6/18. DCRTV and Radio-Online report that an AM station in the Washington, DC region has ceased analog broadcasting, becoming the first radio station in the United States to solely broadcast in digital HD Radio. WWFD 820 Frederick, MD, which airs an AAA format as “The Gamut,” flipped the all-IBOC switch on July 16. Since I am too far away from WWFD to receive it, I cannot verify if the station simply removed its analog frequency from its broadcast, leaving its existing digital sidebands, or if the station is broadcasting a full power digital signal on its center frequency. The station’s move to all-digital poses an interesting situation for DXers, as it appears now that at least AM stations can apply to go all-digital. Does this mean FM stations are next? I wrote about the possibility of an all-digital FM band in 2013. In that article, I predicted that such a move would both benefit and hurt the DXing hobby. For those who aren’t familiar with the mechanics of HD Radio, a station on 95.5 FM running IBOC broadcasts its analog signal on 95.5, and its digital signal (at a lower power) on 95.3 and 95.7. These adjacent digital “sidebands” ruin DX, as it blocks out all but the strongest distant stations on the frequencies immediately next to a local signal running HD Radio. If the HD Radio standard supports one sole full power digital signal on the center frequency (i.e. a full power digital 95.5 FM and nothing on 95.3 and 95.7 FM), then this could positively revolutionize FM DXing, as these adjacent-to-local frequencies would, once again, be open to any DX, much like it was prior to the debut of IBOC. On the other hand, if the FM band became digital-only, a very strong signal would be required to receive any radio station (rendering weak signals invisible to an HD Radio), much like what one experiences with digital TV DXing. It remains to be seen if WWFD’s digital transition is the first of many to come, or if it is a one-off occurrence. Motion-detected and timestamped screenshot of an HD Radio decode picked up by the WyzeCam on 1/19/18. DXers with RDS and HD Radio-capable receivers now have a new and interesting way of seeing everything that comes across their radio’s screens while they are away — literally. Wyze is a home security camera company that sells “WyzeCam,” an HD-quality home security camera. I purchased a few cameras for my home in the previous month, and I have used them for their intended purpose until I realized that the device opens up a new world of capabilities for the average DXer. It’s the legal ID of a radio station I’ll never forget. The Washington, DC market had three full-time CHR stations in the 1980s: 105.1 “Power 105” WAVA, 106.7 “B106” WBMW, and 107.3 “Q107” WRQX. Unfortunately for area listeners, these signals slowly left the format one by one — WBMW in 1988, WRQX in 1990, and WAVA in 1992, leaving Washington without a CHR station until 1996, when Z104 debuted. Z104 was actually two signals: 104.1 WWZZ covering southern Maryland and the south and eastern suburbs of Washington, previously classic hits WXTR “Xtra 104,” and 103.9 WWVZ, which covered the nearby small market of Frederick, MD. Prior to its debut, WWVZ was CHR as “Z104,” but it was an unrelated station that was replaced with the new Z104 simulcast. Could there be a radio better than the Sony XDR-F1HD? My answer would have been a resounding “no,” that is, until I came across the Airspy R2. DXing is the hobby of logging distant broadcast signals. I have been DXing for 20 years from Northern Virginia. 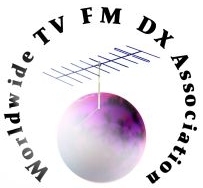 This website focuses on DXing the FM, AM, and TV bands. For more information about DXing, click on ‘Sections’ then ‘About DX’ from the drop-down menu linked above.